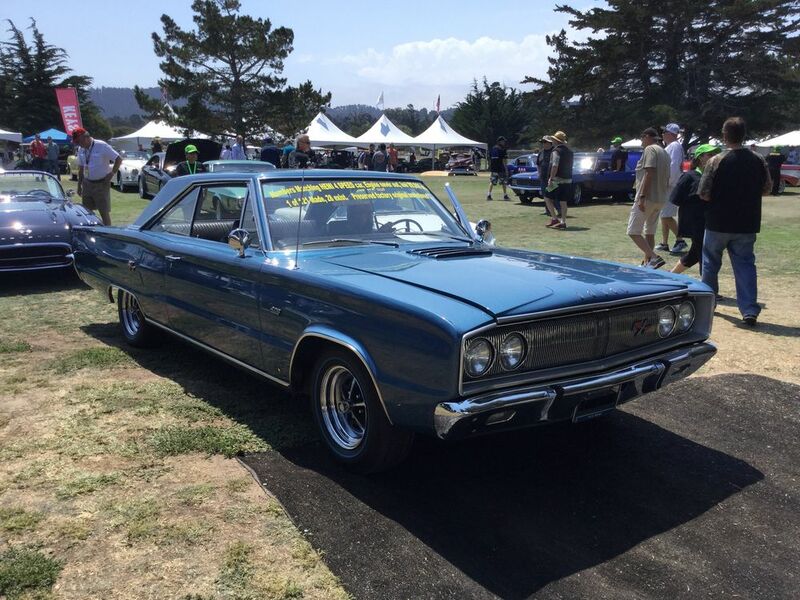 1967 Dodge Hemi Coronet R/T; image by the author. When covering any auction for our print publications, a simple rule of thumb — we do our best to adhere to — is to review a few extra vehicular lots. It’s good practice, since one never knows if a lot is going to be withdrawn at the last minute, or — worse — we forgot to snag a photo of the car we just examined, only to discover that error when we return to the office. Which means that by the time our more detailed coverage is readied for print, we end up with a few on the proverbial cutting-room floor. It doesn’t mean they are no less interesting; we just simply ran out of space. Regular readers of our Hemmings Muscle Machines magazine will have begun to see in-depth auction action — from Monterey’s 2017 Meet Week — in our December 2017 issue. It continues with the upcoming January 2018 issue featuring coverage from Mecum Auctions. Their sale, known as “the daytime auction,” was held on August 16-19 at the Del Monte Golf Course adjacent to the Hyatt Regency Monterey Hotel and Spa, and, while European makes claimed most of the top 10 in sales, muscle cars had a solid showing, contributing to the $34-million extravaganza. One of the 600 vehicular lots that crossed the block was the car pictured above: a 1967 Dodge Coronet R/T. Attraction in the muscle-car marketplace can focus on several areas, but unrestored cars like this 426 Hemi-powered 4-speed 1967 Dodge Coronet R/T are among the cars in highest demand today. Introduced that year, the R/T model stood for “Road/Track,” but these were truly upscale releases with deluxe standard equipment. R/T optioning was limited to two engines: the standard A134 440 Magnum wedge, and the extra-cost A102 Street Hemi found here. By the end of the ’67 model run, only 121 Dodge new-car buyers had ordered the expensive 426 Hemi with an accompanying 4-speed transmission. Showing 89,000 original miles today, this car is one of only 28 known to still exist. Most important is the factory matching-numbers J-code 426 Hemi engine. Rated at 425 HP, this legendary powerplant retains its original factory dual Carter AFB carburetors. The rest of the driveline was built to last from day one and it has, as the original A833 4-speed transmission and factory-installed 3.54:1 Dana 60 rear end with Sure Grip traction components are intact. Inside, one finds the original black vinyl upholstery, with the console-mounted shifter and tachometer, horizontal dash gauge layout and bucket seats. Other options are the factory power disc brakes and even factory bumper guards. The rust-free hardtop body is covered in bright blue, complemented with the R/T’s special cast grille and rear-valance treatments, R/T emblems and original factory Magnum 500 wheels with Blue Streak tires. Documented with both the original factory Certi-Card and fender tag, the sale of this special muscle car will include a copy of the IBM build sheet from Chrysler, a Chrysler Registry report and the original factory owner’s and warranty manuals in their original folder with sales brochure. With the console lid personally autographed by legends Richard Petty and Don Garlits, this Dodge Coronet R/T is your unique opportunity to own an unrestored Hemi monster. We happened upon the mighty Mopar as it was about to enter the auction tent, where it was estimated to sell between $100,000-$120,000. Given the fact that it was a truly unrestored, original car — in other words, had not received new paint, upholstery, engine, etc. — we noticed a series of expected factory traits, such as some areas of inconsistent body prep below the paint, the latter of which exhibited a mildly citrus-like surface throughout most of the exterior. Other than polish swirls and a few barely perceivable nicks and touch-ups, there was little to speak of visually. Wear to the interior was relatively minor compared to others we’ve seen, it’s overall condition bolstered by claims of climate-controlled storage when not in use. As to the engine bay, it was presentable but understandably not in show-winning condition. We gave it a condition #2 rating that, according to our resources, translates to an approximate value of $95,000. Under the stage lights, bidding quickly climbed to $70,000 and stalled out to a no-sale result. Be sure to check out the aforementioned January 2018 issue of Hemmings Muscle Machines for 15 additional cars, as well as another 24 featured lots in an upcoming issue of Hemmings Motor News.